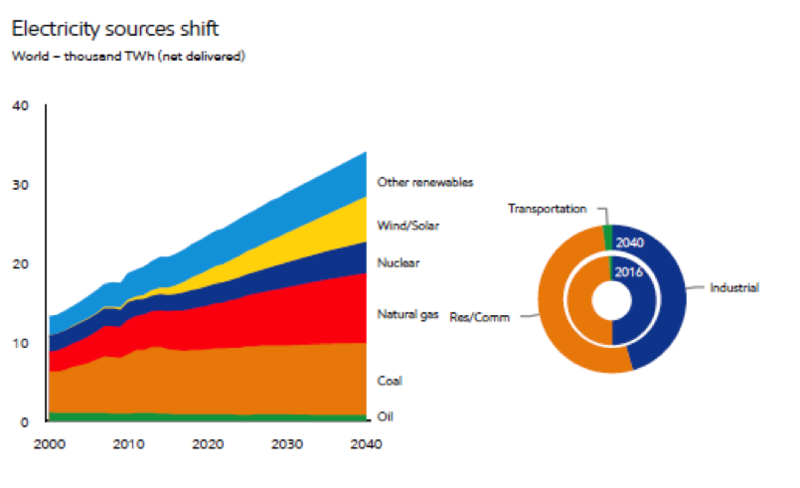 Global energy demand will increase by about 25 percent by 2040, with most increases coming from non-OECD countries, especially China and India. Global electricity demand is expected to increase by 60 percent between 2016 and 2040 with non-OECD countries almost doubling their usage. Solar and wind generation is expected to increase by about 400 percent, with their combined share tripling by 2040. 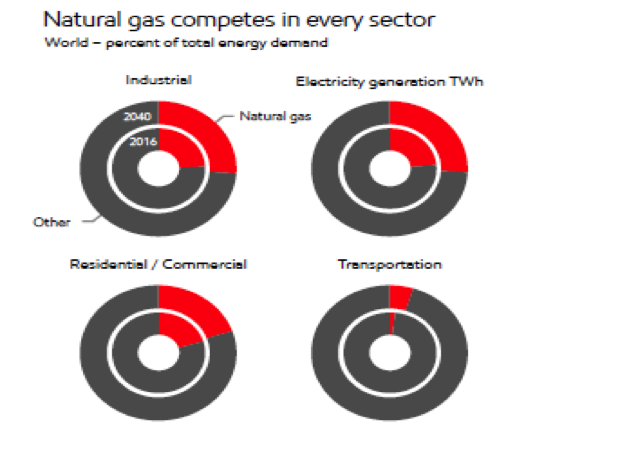 Despite the increases in wind and solar, the abundance, versatility and flexibility of natural gas results in its increasing more than any other source with about 50 percent of its growth in electric generation markets. Liquid fuels are expected to peak in the light duty vehicle market by 2030 due to electric vehicles and efficiency improvements in conventional engines, but growth in liquid fuels is still expected in the commercial transportation sector and the chemical industry. 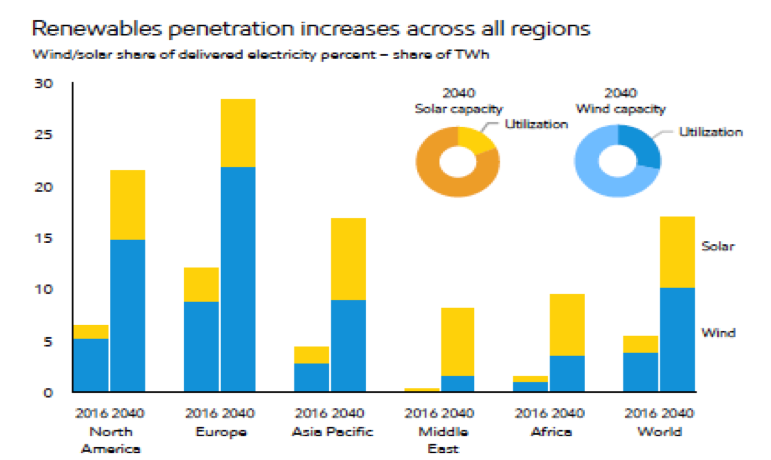 Global demand is expected to reach 680 quadrillion BTUs in 2040—an increase of almost 25 percent—with China and India contributing about 45 percent. The non-OECD share of energy demand grows to about 70 percent as efficiency improvements and slowing economic growth in the OECD hold energy demand relatively flat. The combined share of the energy use in the United States and the European OECD countries is expected to decline from 30 percent to 20 percent in 2040, which is about equal to China’s share of world energy demand. 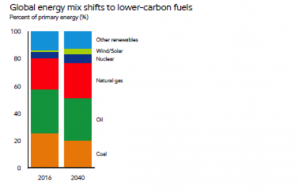 Renewable energy and nuclear contribute almost 40 percent of incremental energy supply, while natural gas grows the most, reaching 25 percent of total demand. Oil’s demand grows due to commercial transportation needs and feedstock requirements for the chemical industry. Coal use loses some of its share as the world moves toward fuels with lower carbon dioxide emissions. 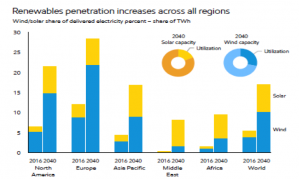 Global electricity demand is expected to grow by 60 percent between 2016 and 2040. The industrial share of global demand declines as China’s economy shifts from heavy industry to services. 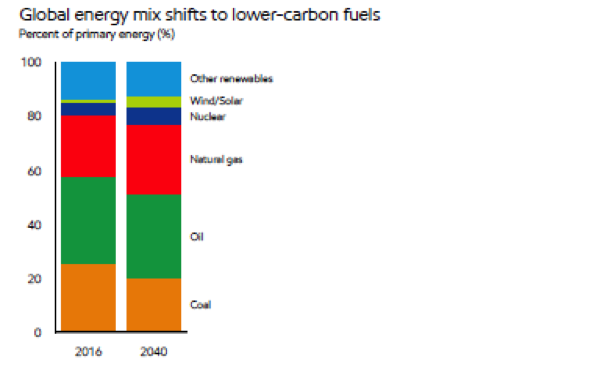 Generation sources move to lower carbon sources including natural gas, renewables, and nuclear power. Over 50 percent of nuclear power’s growth is in China. Wind and solar’s share of delivered electricity is expected to increase from 5 percent in 2016 to 17 percent in 2040. In North America and Europe, wind and solar provide over 20 percent of delivered electricity by 2040. Coal’s share of global electricity generation is projected to decline from about 40 percent in 2016 to less than 30 percent in 2040. Oil is projected to provide the largest share of energy supply due to the needs of the transportation and chemical sectors. 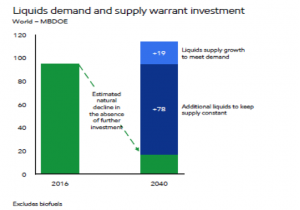 Worldwide, liquids demand is expected to increase by about 20 percent between 2016 and 2040. Natural gas is projected to increase the most of any fuel to supply the needs of the electricity and industrial sectors. Together oil and natural gas continue to supply about 55 percent of the world’s energy needs through 2040. Nuclear demand is projected to increase by 70 percent led by China. Wind, solar, and biofuels are expected to account for about 5 percent of the world’s energy demand, growing together by about 5 percent per year. 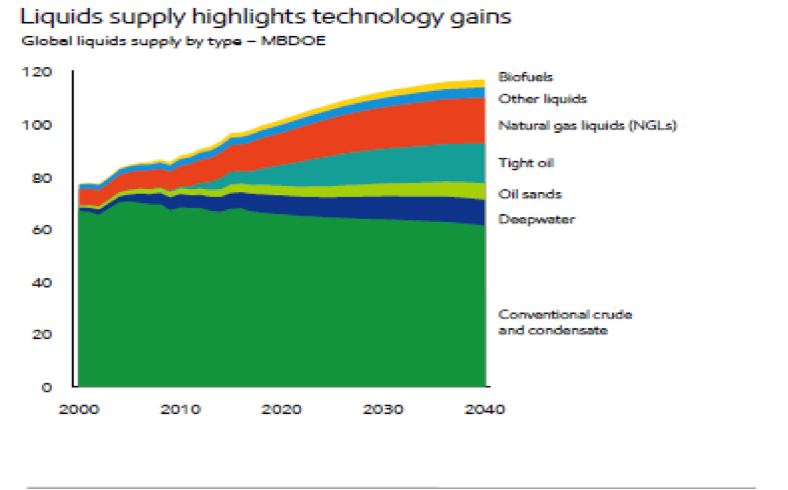 Technology leads to growth in natural gas liquids, tight oil, deep water, oil sands, and biofuels, but continued investment is needed to mitigate declines in production and meet increasing demand. Technology also enables efficient production from conventional sources that are expected to supply over 50 percent of production in 2040. But, the majority of the growth is expected to come from tight oil and natural gas liquids, which reach 30 percent of global liquids supply by 2040. North America is expected to become a net oil exporter as shale growth continues in the forecast. Asia Pacific oil imports are expected to increase to 80 percent of its oil demand in 2040. Exxon Mobil notes that global oil resources are abundant and resource estimates increase as technology improves. 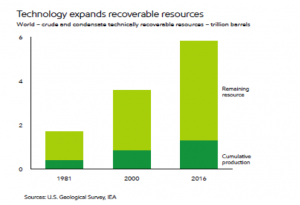 Technology has brought about tight oil (shale oil), deep water and oil sands resources. 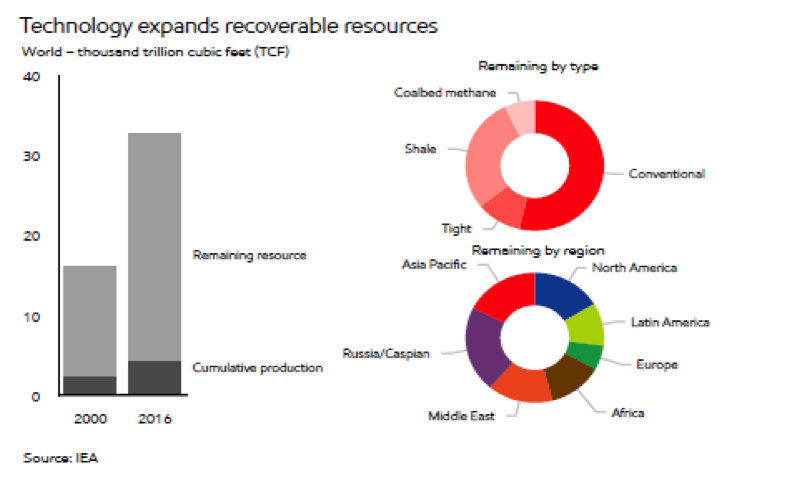 As the chart below shows, less than 25 percent of global oil resources as we know them today have been produced. The remaining oil resources can provide 150 years of supply at current demand levels. As the graph below shows, without further investment, liquids supply would decline steeply. Over 80 percent of new liquids supply is needed to offset the natural decline in production. According to the International Energy Agency, about $400 billion a year of oil investment is needed between 2017 and 2040. Natural gas is used in every sector and supplies about 25 percent of the world’s electricity generation and industrial needs. Global natural gas demand is expected to increase by about 40 percent between 2016 and 2040. The share of natural gas in the world’s supply mix is expected to increase from 23 percent in 2016 to 26 percent in 2040. 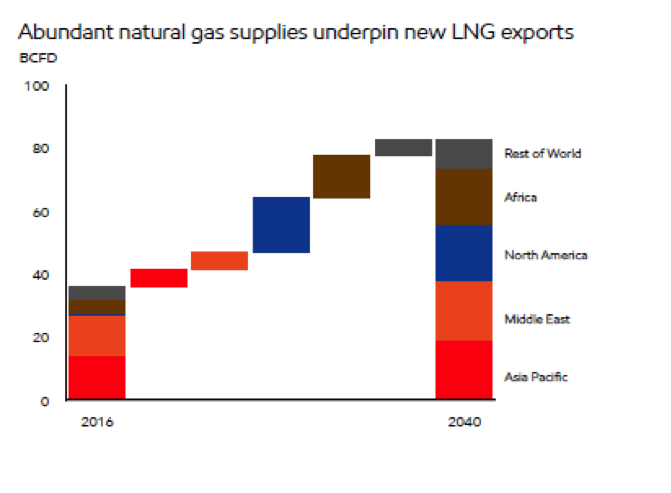 Liquefied natural gas (LNG) trade is expected to supply one-third of the natural gas demand growth between 2016 and 2040. LNG is expected to remain competitive due to abundant natural gas resources and many budding exporters. By 2040, four regions are expected to have similar natural gas exports: Asia Pacific, the Middle East, North America, and Africa. (See chart below.) North America’s LNG exports are expected to increase the most as low-cost unconventional natural gas production prompts investment in LNG. 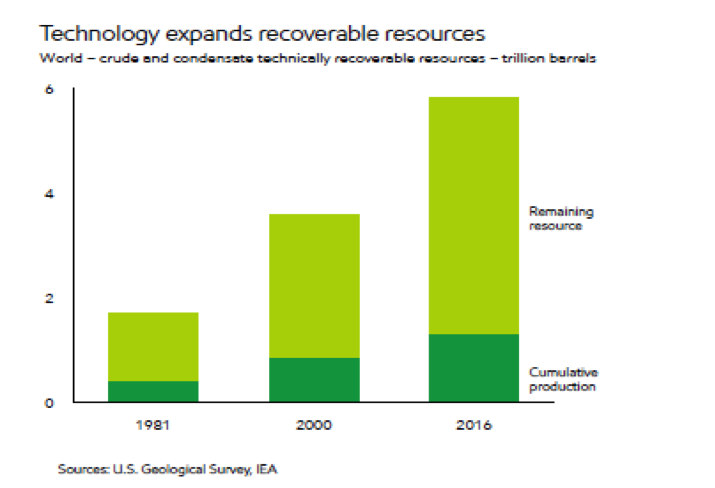 Natural gas resource estimates keep increasing as technology unlocks resources previously considered too difficult or costly to produce. 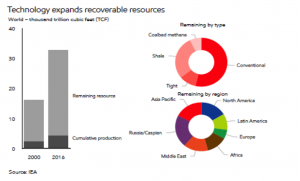 Less than 15 percent of the world’s recoverable natural gas resources have been produced. The remaining natural gas resources can supply over 200 years of natural gas at current demand levels. About 45 percent of the remaining natural gas resources are from unconventional sources like shale gas, tight gas, and coalbed methane. Global carbon dioxide emissions increased by almost 40 percent between 2000 and 2016, despite a decline of about 10 percent in Europe and North America. Exxon Mobil expects global carbon dioxide emissions to peak by 2040 at about 10 percent above 2016 levels. China’s carbon dioxide emissions contributed about 60 percent of the growth in total world carbon dioxide emissions between 2000 and 2016. 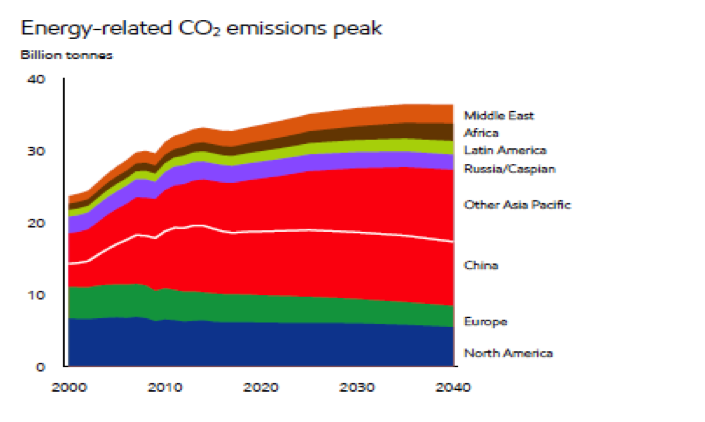 Exxon Mobil expects China’s carbon dioxide emissions to peak in 2030 and gradually decline toward its 2016 level in 2040. This correlates with China’s commitments under the Paris climate agreement. Carbon dioxide emissions outside of North America, Europe, and China increase by about 35 percent between 2016 and 2040 with their share of global carbon dioxide emissions reaching 50 percent by 2040. Regardless of the rate of growth of non-hydroelectric renewable energy, fossil fuels will remain major global energy suppliers through 2040, something the Energy Information Administration recently projected for the United States in its Annual Energy Outlook. Oil demand is still expected to grow despite the advent of electric vehicles in the light-duty vehicle market. 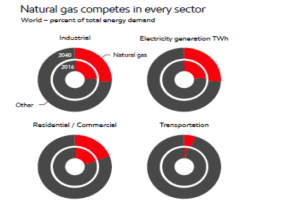 Natural gas demand grows the most due to electric and industrial demands. Only coal takes a beating in market share in global markets in Exxon Mobil’s forecast as countries move away from it due to its carbon content.